Mother2Mother (M2M) is a 501c3 organization focused on supporting Washington DC foundation who advocate for at-risk women and children. At M2M we promote our featured foundation in a bi-annual cabaret style show with music from a variety of Pop, Jazz, Broadway and Off- Broadway selections and an original script written specifically for the event. Each show is produced, cast and performed by community-volunteered singers and musicians from all over the DMV. 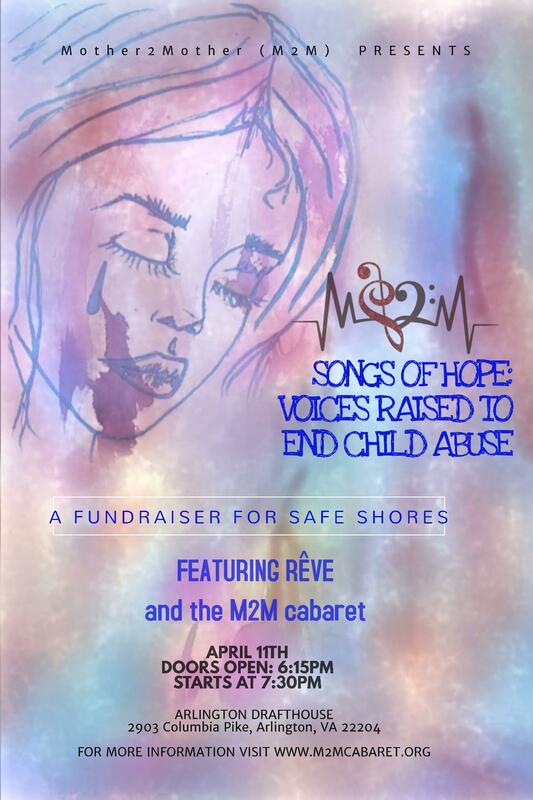 "Songs of Hope: Voices Raised to End Child Abuse", features the Safe Shores foundation, which is dedicated to working with and advocating for children and adolescents affected by trauma and violence. This show is an important and inspiring community event for the Washington, DC metro area. Weaving together the stories and mission of Safe Shores, with the classic stage musical sound, M2M builds a collective spirit with the audience encouraging us all to look at our community. In between each song, a storyline builds into a crescendo of voices, pulling the audience in, calling out to help Safe Shores in their mission: stopping child abuse and helping victims of such trauma life violence free lives in our local Washington, DC area. We are M2M. raising our voices in hope to help end child abuse.